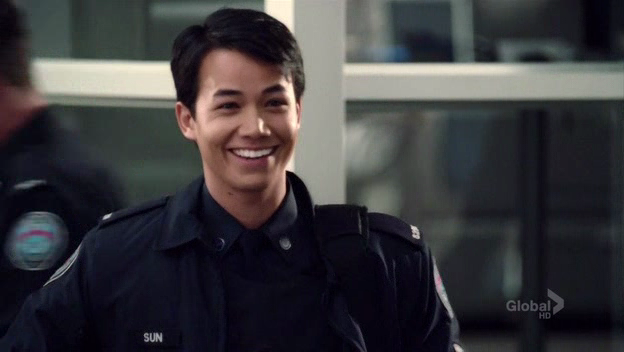 Look who showed up as a new recruit on the Season 2 Finale of Rookie Blue! It’s Shannon Kook-Chun, better known as Zane Park from Degrassi! I believe this now the fifth Degrassi actor to guest star on Rookie Blue, all in the second season. Another classic “keeping it in the Canada!” Who can forget Cory Lee (Ms. Oh) & Samantha Munro (Anya MacPherson) in episode 206? Jordan Todosey (Adam Torres) appeared in 204. And John Bregar (Dylan Michalchuk) in 209. I’m starting to like his character! In the finale of Rookie Blue, while everyone was tensioned up, his character was the most relaxed and the little things he did was hilarious!